Last weekend I was feeling astringent, and that meant it was time to make gastrique. I confess, what I truly desired was not a gastrique but a shrub, but shrubs take several days to make, whereas you can cook up a gastrique in much less than an hour. Both ingredients are made from sugar and vinegar, so if you desire the tang of acetic acid and you don’t have the luxury of waiting two days for your syrup to pickle, a gastrique might be the previously unknown secret desire of your heart. I followed this Serious Eats recipe, which I shall recount briefly for you here, in case clicking on one more hyperlink is too much effort for your web-weary mind and fingers. Combine water and sugar in a pot and cook on medium high heat. Prior to cooking, the sugar should have the texture of wet sand. Heat the sugar until it dissolves and begins to bubble and undulate. Do not stir. Watch the sugar until it has caramelized into a beautiful golden brown, and then add the apple cider vinegar, and reduce the heat to medium. When the caramel has fully dissolved in the vinegar, add the blueberries and stir. Simmer for a few minutes to allow the flavors to meld, and then strain out the blueberry pulp. Making Caramel is, in fact, very easy, and I got this right on my first try. So will you. Gastrique is traditionally served as a sauce on fish or meat, but it’s great in a mixed drink, as you will discover if you try it. The complex flavor of caramel and cider vinegar is best-suited to brown spirits such as bourbon or aged rum; I tried it with Wray and Nephew and it wasn’t right at all. A shrub might go with a lighter spirit, but there is a certain synergy between the brownness of caramel and the brownness of bourbon or rye. Shake over ice and double-strain into a cocktail glass. Garnish with a sprig of fresh rosemary. Even though the vinegar is sour, you need to treat this ingredient like a syrup. It retains the flavor of vinegar, but the sugar in the caramel and the berries flattens its acidity, so citrus juice is still needed. Vinegar has a great flavor, but it’s not something you want to inhale like a scotch. 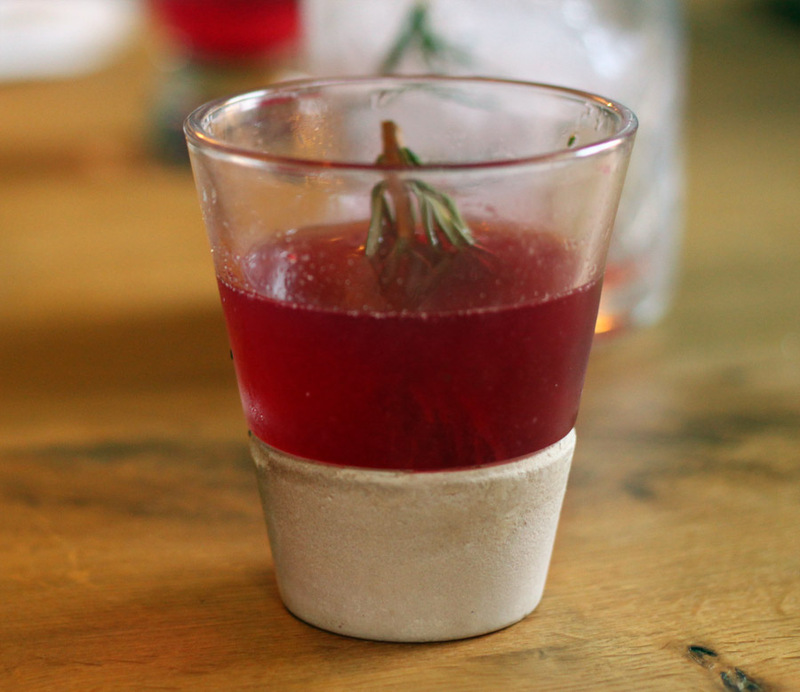 That’s why I garnished the drink with an aromatic herb; the scent of the rosemary saves you from the vinegar’s smell, while complementing its savory qualities. Categories: modern drinks, original creations | Tags: blueberry, booze, cocktail, cocktails, drinking, drinks, gastrique, lime juice, mixed drinks, rosemary, rye, sour, vinegar, whiskey | Permalink. I need to try this. Not sure how I will think of it, but I am really curious, but hopeful since I like blueberries so much. And afterwards, I think I’ll try an apple variation (with brandy, or Applejack). Thanks. I may have never heard of gastriques if you hadn’t posted this.